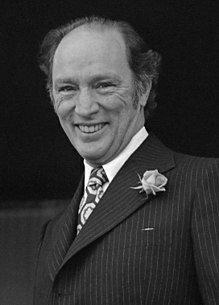 Joseph Philippe Pierre Yves Elliott Trudeau, PC CH CC QC FRSC (/truːˈdoʊ/; French pronunciation: ​[tʁydo]; October 18, 1919 – September 28, 2000), uisually kent as Pierre Trudeau or Pierre Elliott Trudeau, wis the 15t Prime meenister o Canadae frae Aprile 20, 1968, tae Juin 4, 1979, an again frae Mairch 3, 1980, tae Juin 30, 1984. His son Justin Trudeau acame Prime meenister in 2015. This page wis last eeditit on 14 Mey 2018, at 05:37.